PARIS -- The Trump administration on Tuesday pressed ahead with efforts to convince European allies to add tough new requirements to the Iran nuclear deal, a move met with deep skepticism in France where the foreign minister insisted "signatories must stand by their word." 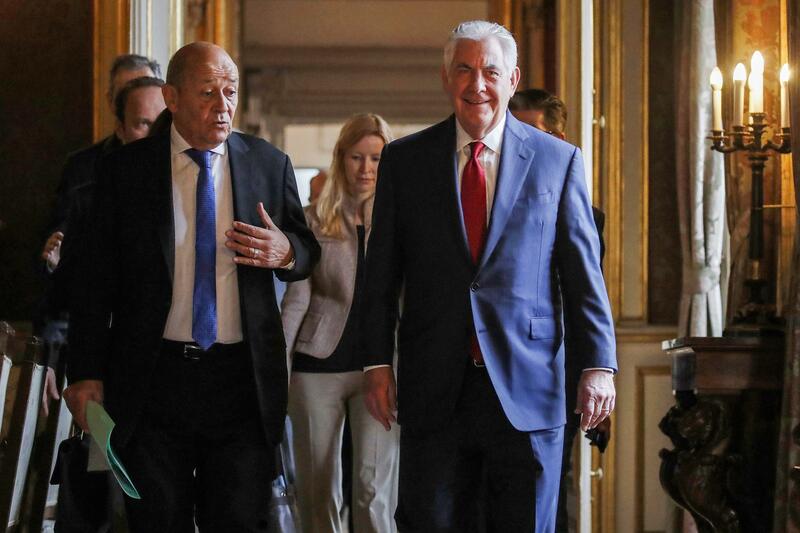 "There is a basic principle on which we are very firm, it's the upholding of the (nuclear deal) to the extent it is respected," Le Drian said, noting that the U.N. nuclear watchdog has said Iran is in compliance. "If it is respected by Iran -- which is what the IAEA says, and we don't have any reason not to believe it - the signatories must stand by their word," Le Drian added. "Because when an agreement is signed, each signatory must respect it. He (Tillerson) knows it." Le Drian also questioned why the Trump administration is "kicking the ball back to Congress and the Europeans," when Russia and China also signed the deal. The administration is also working with Congress to amend or replace U.S. legislation that governs Washington's participation in the nuclear deal, which was a signature foreign policy achievement of the Obama administration but has been denounced by Trump as the worst agreement ever negotiated by the United States. After his talks with British officials on Monday in London, Tillerson sounded cautiously optimistic about getting European backing. He said the U.S. and Britain, France and Germany had a "common view" that the nuclear deal should be supplemented. He said the four countries had agreed to set up a working group of experts on fixing what Trump says are flaws in the deal. The working group is expected to start meeting as early as next week, he said. The group will be looking at "some type of another side agreement perhaps or a mechanism that would address our concerns," Tillerson said. But earlier this month, Mr. Trump vowed to stop waiving U.S. sanctions unless the Europeans agreed to strengthen its terms by consenting to a side deal that would effectively eliminate provisions that allow Iran to gradually resume some advanced atomic work. Mr. Trump also wants tighter restrictions on Iran's ballistic missile program.